Incheonn International Airport Corporation (IIAC) is expanding its overseas business to emerging markets in Eastern Europe. Incheon International Airport, which has won operating rights for Kuwait International Airport Termnal 4(T4) earlier this month, is stepping up its efforts to develop the new airport in Warsaw, Poland, and the airport in Prague, Czech Republic. The president of Incheon International Airport Corporation, Chung Il-young, visited Prague International Airport in the Czech Republic and Warsaw Airport in Poland on the 22nd and 23rd, respectively to discuss the development of new airports between the two countries. Chung visited Prague International Airport on May 22nd and signed a Memorandum of Understanding (MOU) with President Vaclav Lehort for joint research on smart airport implementation and cooperation for increasing passenger and air cargo. Prague International Airport plans to invest about 1.54 billion dollars by 2020 to expand the Domestic Terminal (T2) and add a new runway. Prague International Airport Corporation has requested Incheon Internal Airport to share its know-how regarding the Prague Airport Expansion Project and the development of the surrounding areas through the agreement. IIAC’s President Chung visited the headquarters of Poland International Airport (LOT) on May 23rd afternoon (local time) to discuss the development of a new airport in Warsaw and also attended a marketing meeting with the company to give a brief of its know-how on the Second Terminal of the Incheon International Airport that opened earlier this month and the 1.54 billion dollars’ contract of the Kuwait International Airport. The Polish government is pushing to build a new airport in the year 2027 to solve the problem of facility saturation at the existing Warsaw airport. The airport, which can accommodate 45 million people a year, will be used by 100 million people to become one of the world’s top 10 airports. 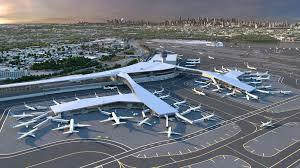 The corporation expects that the new airport project will lead to the advancement of Korean companies in a variety of fields such as design, construction, export of equipment and airport operations. “We will take the lead in national economic development by expanding our overseas business to all over the world including Eastern Europe, Southeast Asia and India based on the high-level know-how proven by the contract awarding operation of the Kuwait International Airport,” said IIAC President Chung Il-young.